This restaurant is a bit farther away from the city centre but definitely worth a visit! Melba is located in the winter harbour of the river Danube, near the BKK boat stop. We celebrate every important family date here because it always meet our needs. 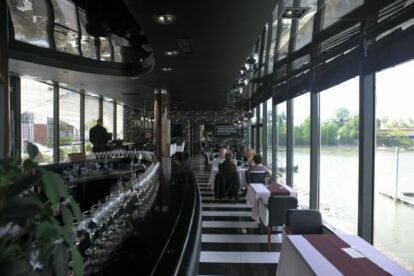 It’s also nice just to have a drink after work here and enjoy the spectacular river view. The owner is a famous Hungarian TV chef who created his own Hungarian cuisine here. They take food and service very seriously. The menu is always seasonal, using only fresh and mostly Hungarian ingredients. I had letcho, goulash and paprikash here which are the most Hungarian courses you could order. The only place where we’ve never had any problem with it! I always feel it’s special thanks to the service. Welcoming and professional but personal at the same time. We like the waiters’ attitude and point of view of how they handle their guests! Super environment, affordable and lovely food!